Singer-songwriter and Mounties drummer Hawksley Workman is set to shine the spotlight back on his solo career this spring, and Exclaim! has got the first look at his new video for "Don't Take Yourself Away (Instant Nostalgia)." The track is slated to appear on his forthcoming full-length Old Cheetah, and the video is a wild one. Described as "one part Brontë, one part John Bender," the new clip brings together the unexpected worlds of Wuthering Heights and The Breakfast Club, with a rebellious-looking Workman delivering the tune against a backdrop of spooky moorlands. 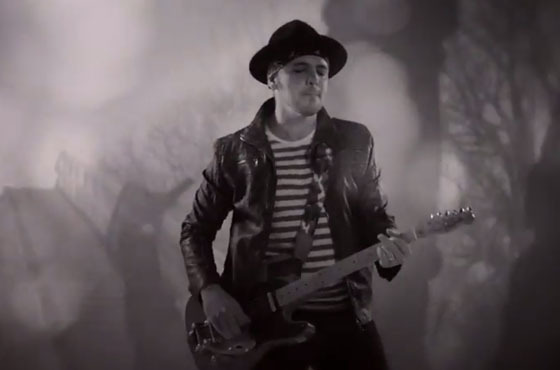 Tied together by the cultural references' shared "brooding gothic angst," the video was directed by Ken Cunningham and serves as an entertaining accompaniment to the theatrical, glam rock-inspired pop song. Old Cheetah arrives on June 2 via Six Shooter Records. Watch the clip for "Don't Take Yourself Away (Instant Nostalgia)" in the player below.